When the weather starts getting cooler, there are a few steps you need to take in order to keep your pets safe. Just as your body adapts to the cold weather, your pet’s does too. Follow these quick tips to keep your pets safe this winter season. Many people assume that pets don’t get cold because of their fur coats, but that’s not true. Just like people, pets get cold and are at risk of hypothermia and frostbite. 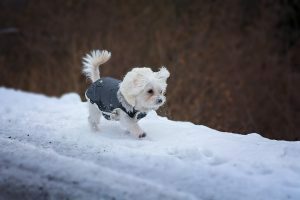 Cold tolerance varies from pet to pet and is based on many factors, including size, coat density, body fat, activity level, and overall health. 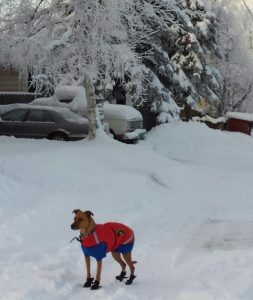 Also, pets that are closer to the ground may get cold faster because their bodies are more likely to come into contact with snowy and cool ground. Consider a sweater for these animals for extra warmth, as it really does make a big difference. Cats and dogs should be kept indoors when the weather turns cold. Bathroom breaks and play sessions are appropriate but do not leave pets outside in freezing temperatures, especially unattended. Pets exposed to the freezing elements for too long can become dangerously ill and are at risk of death. Felines who venture outdoors are at high risk of becoming prey—and in the winter, there are added risks. Cats are curious creatures and may unknowingly put themselves at risk by eating or drinking something poisonous that doesn’t freeze. Wild animals also may be closer to homes during the winter months as food is scarce. Best to keep your cat indoors, period. Cats love cars year-round because it’s a seemingly safe hiding spot. But they especially love cars in the winter because the heat that comes off them is very enticing when it’s frigid outside. 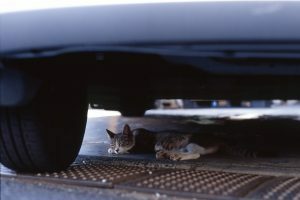 They can get into the wheel wells and up into warm engine cavities, so before starting your vehicle, honk or at least make some loud noises like knocking on the hood to prompt any kitties to evacuate before they are harmed. Beware of leaving pets inside of a car in the winter as they rapidly turn cold without active heating and may trap the animal inside. Don’t use salt or chemical melting products on walkways or driveways. Keep antifreeze, rock salt, and other poisonous chemicals away from your pets and other animals. When walking outside, your pet’s paws, legs, and fur may pick up antifreeze, deicers, or other chemicals. Be sure to wipe your pet down after being outside to remove any toxins, especially before they have a chance to lick themselves and ingest these poisons. Consider using booties or a salve to protect sensitive paws. If your pet is shivering, crying, whining, barking, meowing, seems anxious, slows or stops moving (lethargic), appears weak, or starts looking for warm places to burrow, get them inside immediately—these are signs of hypothermia. Frostbite may not be fully recognized until a few days after the damage is done when it is too late. If you suspect your pet has hypothermia or frostbite, call your veterinarian or emergency clinic immediately. Make sure to keep your pet safe in cold weather.